AOA has returned for the summer of 2015 with their third mini album, entitled Heart Attack. Heart Attack is definitely a summer release, designed with a certain lightness and carefree element for maximum playabilility as the weather heats up and windows roll down. This allows AOA to change up their repertoire without giving up their sound. Heart Attack dives right into the thick of things with title track “Heart Attack”. 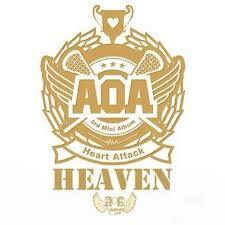 Being yet another Brave Brothers track by AOA, the song is definitely familiar. But in this case, it works. “Heart Attack” is clearly an AOA release, with the driving synths and repetitive chorus, but at the same time, it’s different than any of their 2014 releases. Where “Miniskirt”, “Short Hair”, and “Like A Cat” were slower, bordering on anemic, “Heart Attack” is peppy and high-energy, with the sing-song chorus and clapping working to build an atmosphere almost like cheerleading chants. “Luv Me” contains many similarities to “Heart Attack”, but not so many that it feels like a knock-off. “Luv Me” retains the pep and verve of “Heart Attack”, as well as a rather addictive chorus with a distinctive sing-song vibe. However, “Luv Me” has a strong euro-pop sound, with the clear synths and a tendency towards repeating specific loops at various points. Honestly, that repetitiveness is the biggest weakness of “Luv Me”. It’s fun to listen to at first, but it gets old really quickly. “Come To Me” is easily the standout song on Heart Attack. Despite carrying sounds from the early days of disco, it’s a mid tempo piece, fueled not by the instrumentals but the vocal arrangement. One the whole, the music is fairly sedate; staying flat throughout most of the song. The build-up to the climax comes from the clear drop-offs and pick-ups of various members coming in and out. Add in the vocal descents during the chorus, and “Come To Me” is a hypnotic wonder. “One Thing” is that rare thing of K-pop, a virtual holy grail: it’s a musically interesting ballad. The soft, almost delicate vocals are not laid against an equally soft track, but driving guitars that push “One Thing” with clarity and direction. This both highlights the softness of the vocals, thus adding emphasis to the lyrics about coping with a harsh break-up, and gives “One Thing” a genuine backbone. AOA’s words about moving on don’t feel hollow like most ballads, because the instrumentation is not sterile and halted, but full of determination. “Really Really”, sadly, fails to live up to the bar set by “One Thing”. It’s the other ballad of Heart Attack, with all the usual pitfalls of K-pop ballads. Lifeless beat, dull instrumentation, run-of-the mill vocal arrangements; there is nothing good here. “Heart Attack” and “Luv Me” may have been repetitive, but “Really Really” is out-and-out dull. Heart Attack rounds out with “Chocolate”. Part of me wants to applaud “Chocolate” for being a song where women take the dominant role in seduction, because that doesn’t happen often. The rest of me is stuck on the fact that “Chocolate” isn’t a very good song. It’s going for seductive, but misses the mark. The slow beat isn’t lush, it’s boring. The vocals sound empty and hollow, like AOA are reading directions for changing a tire rather than persuading a guy into bed. Piled on after “Really Really”, the sax riff is literally the only thing keeping me awake, and I kind of wish it wasn’t. On the whole, I enjoyed Heart Attack far more than I was expecting to. Barring the final two tracks, it’s a solid release that gives AOA a new musical direction, and provides some quality songs. Heart Attack isn’t the best thing ever, but it’s sure as heck not bad. I Remember You, Episodes 1-2: Murder, Mystery and More!